I've recently started up one of my UE4 projects and some of my .uassets and one of my .umaps are missing in the content browser, but is still in the source folder. I'm not sure what has caused this and I have tried several methods on the AnswerHub and Forum but my problem still persists. Deleting the Intermediate folder or CachedAssetRegistry.bin has had no effect and the autosaves won't appear in the content browser either. I'm fairly stumped now. Has anyone else had this issue before and found a fix? Would really like to know ASAP as I've put a lot of work into this project! So importing to a new project hasn't resolved it and upgrading to UE4.14 hasn't made any difference either. 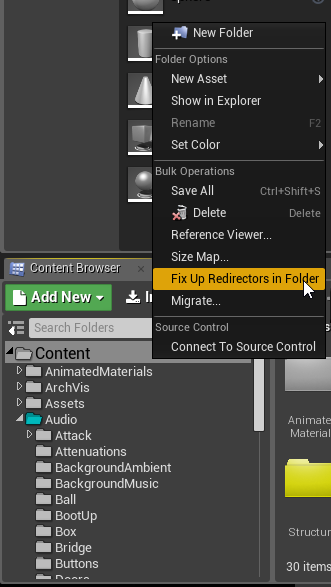 Right click on Content and then on Fix Up Redirections in Folder. This hasn't worked either, when I get my Ue4.13 reinstalled i'll try it on that version and see if it works. Are you sure the .uassets are in the Contents folder? Also, are the files from the same version as you are currently using? Are 4.6.0 assets not compatible with 4.4.3? In Content Browser why are assets not actualy deleteing? How to add a map (created in UE4 but from another computer) in my Project (description)? Why does deleting textures take a long time?